A few weeks ago I posted about the concept of what constitutes a sacred sthala/temple, and the astronomical connections and related meaning. In a reaction Saurabh Saxena formulated several relevant questions which deserve a detailed answer. Thank you Saurabh for inspiring me to formulate my thoughts on this. The interesting point is how old is a temple tree which is now taken sacred? Did the temple come first or the tree, or both together? 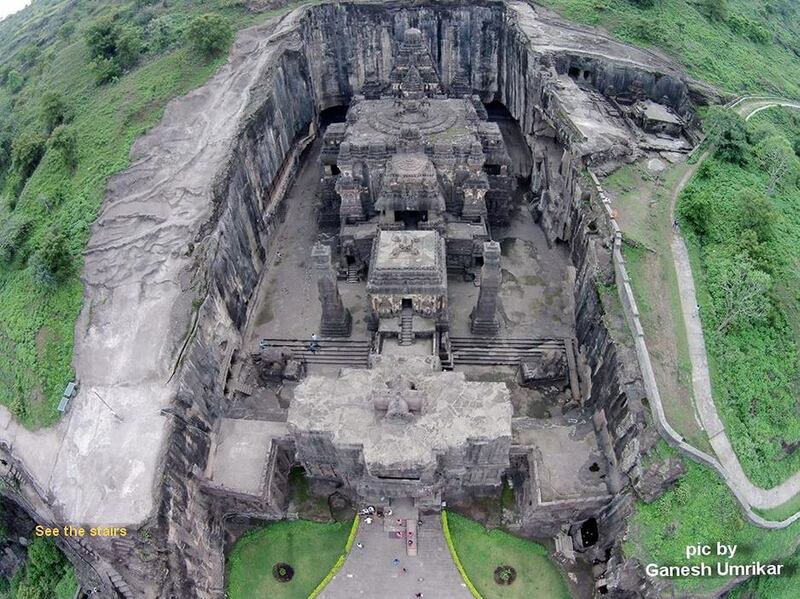 Kailasha temple in Ellora, cut from the living rock. I have read that for erecting a temple, a place nearby a water source, or a place on mountain or in a forest grove are taken as appropriate however we also see many temples which deviate from this principle. There arise a confusion here, was there a common thread which can bind all these different attributes of temples, was there a common guide which laid down the rules, or was it left to the designer and architect providing them a freedom around a loosely coupled periphery where they were free to think and design as per the needs of the hour? We always think that there must be a though, a well-defined one, behind everything, specially if it is ancient or coming from our scriptures, and then we start thinking within this boundary, but what if there is no such thing? What if not every thing has a deep meaning, of course there are things having some hidden meaning but not all? Is our thinking already biased as out thought process is to find the hidden truth or meaning behind a tradition assuming that there is some hidden meaning? How will be the end, if we start questioning the very thought process? Let us start that there was no hidden meaning in the tree, water source etc. How many temples we have where there is no water source nearby? What if there is a water source, what was the practical need for which it was made or chosen? How many temples we have where there is no tree associated? And if there is a tree associated, which came first, the temple or the tree? Please do not take me in a wrong manner, it is a quest to find answers, if there is one. And if there is an answer then I am in quest of a right answer. The questions make several points, some general, some specific. Specific points are the questions with respect to why temples that may or may not have a water place or a sacred tree. A general point is whether or not there is meaning behind the concepts of temples and rituals. This last one is THE BIG QUESTION. When our ancestors created the amazing ancient monuments like the Kailash temple in Ellora, Stonehenge of England, the pyramids in Giza and the innumerable other structures and rituals and stories, were they working from some deeper knowledge and understanding, or were they just following their personal fancy? It is an important question, because if it was the last option, we don’t need to take it serious. If the was the first, we should take it serious, should we not? Saurabh also suggest a kind of immediate position, some things may have meaning, but not everything. He is seriously looking to answer this question. So are others, and so am I. It is a big question, to which I can personally give a short answer and a long one. The short answer is that I have no doubt that whatever the ancients conceived, it was from the concept of meaning. The long answer could easily fill a library. Because the proof of this is complex and comprehensive. Luckily many great scholars have contributed to this so I will give a short introductory list for reading below. Why do I think ancient humanity acted from meaning? Because that is how we are made, how we function. Just think of the Kailash temple at Ellora, or the Giza pyramids. The sheer effort involved, could fancy, fashion, be the motivation behind these? If it were fancy we would loose interest long before any of it was completed. This is the psychological answer. The second element of the answer is the doctrine itself. Now in places like Stonehenge or Giza we have no oral or written evidence, but in India there still exist both libraries full of manuscripts and living scholarship that explicitly and implicitly states there is deep and sometimes hidden meaning behind the doctrines of ritual, architecture and art. The Vedas with the Brahmanas and Upanishads, the Agamas and Tantras, all offer explanations with the instructions. Today we largely find these contradictory, confusing and strange. Is it their failure or ours? For reasons I don’t quite understand it is my position which is forced to defend and prove itself. Somehow Western scholarship and academia assumes humanity evolved from basically stupid and primitive to what is considered today’s high standard of thought and technology. It is an assumption I have never understood, from my schooldays onward till today. Just look at my examples, the Giza pyramids, Stonehenge and Ellora, is there anything primitive about them? And both the Giza pyramids and Stonehenge have already been shown to have astronomical, mathematical and geometrical knowledge encoded into their very structure. 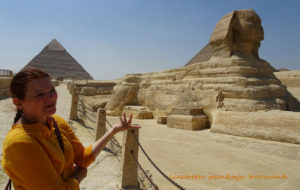 The post which activated these questions was actually about bringing to light proof that there is an international, worldwide, and very ancient connection between spiritual traditions, through both the open and hidden meaning. That astronomy is one of the connecting layers of meaning and that concepts of spiritual journey and rebirth is another. This proof is scattered, and what is secret in one part of the world, is open knowledge and understanding in another. That this all together forms a pattern, and that this pattern to us is a puzzle, for which we can find the pieces scattered here and there, and everywhere, if we would only look. This brings us to the other, specific, side of Saurabh’s questions. Why do some temples have sacred trees, or a water place, and not others? Why do some aspects express meaning and not others? And what came first, the sacred tree or the temple? The original statement by my guru Raja Deekshithar about the nature of a sacred place, a sthala, originated from doctrine, teaching. The statement was that a sthala needs to have and/or necessarily consists of a tree (vriksha), a waterplace (tirtha), and an embodiment, form (murti). He studied with various masters and also studied texts. I don’t know where this came from specifically. It might be found in a text. But I also know that in the context of India texts represent only about ten percent of the body of knowledge relevant to any tradition. And I also know countless texts, and even more oral knowledge has been lost in the past centuries. It becomes really fascinating when I show that there is an international connection which makes what is hidden or lost in one part of the world meaningful and understood through scraps of folklore from the other side of the world. Actually directly proving my position. The fall-out of the accidents of history of the past can also explain why certain sacred places may today not have a sacred tree or a water place. Temples have been abandoned and brought back to life over the centuries. Were even destroyed and rebuild at another place. Like the Kapalishvara in Mylapore, or the great Minakshi temple in Madurai. The past century countless sthala puranas have been lost. With the loss of knowledge even I can see traditions are today sometimes started from the vision or emotion of people, and grow from the collective subconscious. Even in such developments often the traces of lost understanding resurface, as people incorporate existing traditions in new developments. The mythologies of temples often express just that. Somebody sleeps under a tree, has a dream, a god appears to him and gives instructions. He digs among the roots and finds a Lingam. And builds a temple. Then the temple is build according to the existing doctrine. Was this Lingam the remains of a temple from an earlier time that had disappeared? For instance Manikkavasakar and the temple he build for Shiva in Avudaiyarkoil. He received instructions from Shiva himself. The temple structure itself is full of astronomical references. As I am myself questing to discover the visible and hidden meaning of the ancient traditions, I will surely continue to share my discoveries. And so will others. Maybe our proof won’t satisfy. I don’t know. I can ask, is it important? Even in my own life-time I have witnessed the ongoing damage to the Indian knowledge base, to monuments, and have felt helpless because besides researching and writing I have no means to counteract this development. In a world where only money power is heard, and given priority, I am a scholar motivated by wisdom and the heart. My wealth is my heart, my art and my brain, and in today’s world I don’t know how to convert this into hard currency. So I doggedly just go on. Because my soul, my atman, tells me it is the right thing to do. It is all I can do. So dear friend Saurabh, and others who may feel inspired, let’s get on with it and see how much meaning we can elicit from the monuments, the temples, the texts and traditions. And if there are people who want to try and prove the opposite, welcome, as the best way forward is discussion. 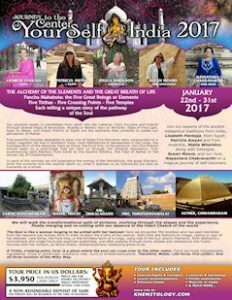 PS if you would like to know more and personally experience the meaning behind the beautiful and mysterious Indian temples and their traditions, join me and the Khemitology team on the Journey to the Center of your Self, 22 January to 1 February 2017, to the Mahabhuta Sthala, the Five Elements Temples of South India. I haven’t studied these subjects but my mind says something. Today’s sacred may not be tomorrow and yesterday’s is not today. Why? Giza and Stonehenge are not temples. My personal experience with temples are like this. Whether well built well architectural temple or simple small temple in any village or town, it has ‘feeling’. And type of feeling depends upon phycology of people visiting. Take examples of temples and graveyards. In temples you will find piece of mind, satisfaction cause that is the emotions of people while in graveyards you will feel sadness, depression as people emotions there. In short for psychological effects to smoothen the people mind concept of temples, a closed environmental place was considered. Naturally it has to be bit away from locality but need to have water source and tree to provide open air shade other than temple where people can rest as well perform some rituals. What are rituals? These depends upon knowledge, psychology, emotional and traditional aspects of group of people. The temples have inner sanctum which is very small with no windows (no light) and entrance is of low light. Even with today’s various power generators, no lights are flooded inside sanctum. This is to concentrate devotee’s mind at God, idol. A lot can be specified on this subject but 1) sacredness is due to devotees emotions. 2) Surrounding and architecture of temples are supporting to enhance / elevate psychology and emotions of devotees. Please read low hight instead low light of sanctum entrance. Why do you think Stonehenge and the Giza Pyramids are not temples? Or do not generate psychological impact? A basic question arises that why there was a need of a hidden meaning/message in any structure be it a temple, a pyramid or something else? If the ancients wanted to pass a message, why not in straight way? Just taking an example, if a temple was constructed, it was constructed with the same meaning and purpose as it is done today. Now if someone comes up with an idea that the temple had a hidden meaning and it was used as an observatory or to study the movement of stars, my simple question to the person would be why? Why someone will construct a temple to study stars or astronomy, he can simple construct a secular building to do so, what was the reason to hide this study in the disguise of another structure? If this question can be answered, then I am ready to take that proposition seriously, otherwise it would be hard to follow the theory as evidences are lacking. Now to take the discussion forward, we need to discuss on something substantial, about specific structures etc. instead of talking in generic terms. Do you have something in mind, some structure/temple, on which such a discussion can be taken forward? I remember seeing a video where it was proposed that the wheel in the Sun temple at Konark were used to derive the time of the day and night. At the moment I do not have much information on the Konark temple, however just looking at the proposition that the temple was used to determine the time of the day and night does not seem very convincing.